The Galileo spacecraft took this picture of Venus in 1990. It has been filtered and colorized to enhance cloud forms. The sulfuric acid clouds are somewhat similar to fair weather clouds on Earth. 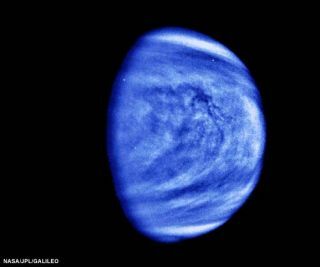 Venus is commonly known as Earth's "twin sister," but when it comes to being alike, these two are more like Arnold Schwarzenegger and Danny DeVito than Mary Kate and Ashley Olsen. After the Sun and the Moon, Venus is the third brightest body in our sky, and because of this it received lots of attention from all the great ancient civilizations, including the Mayans, the Egyptians, and the Greeks. As early as 1600 B.C. the Babylonians kept detailed records of its movement across the sky. But in modern times our nearest neighbor has been somewhat neglected and only three missions have been dedicated to studying the heavily clouded planet. As a result, there is still a lot astronomers don't know about Venus. Even the things they do know fairly well, such as the contents of its atmosphere, speed of rotation, and texture of its surface, continue to raise questions. The European Space Agency plans soon to launch the instrument-loaded Venus Express satellite, which will orbit the "evening star" for two years. Over the course of the mission the satellite will bounce radio waves off the planet's young surface, snap pictures of its swirling atmosphere, take the temperature of the clouds, and search for hints of a magnetic field. All this data will help scientists better understand a planet that from the outside resembles an early Earth and perhaps reveal clues of the existence of life. Clear skies, temperatures around 80 degrees Fahrenheit, and a light breeze are the recipe for a perfect day for a walk on Earth, but you'd be hard pressed to find a day like that on Venus. First of all, there's no such thing as clear skies on Venus. The entire planet is covered by a dense layer of clouds about 40 miles thick. The atmosphere is so dense that walking on Venus' surface would be like walking under 3,000 feet of water here on Earth. You'd be crushed. And although Venus reflects about 80 percent of the Sun's radiation - Earth soaks up more - you can forget having an 80-degree day. Venus' atmosphere is about 95 percent carbon dioxide, which traps heat from the Sun so efficiently that surface temperatures average more than 860 degrees Fahrenheit. That makes Venus hotter than Mercury, even though it's twice as far from the Sun and receives only 25 percent of the solar radiance. You might get that light breeze, however. Winds in the upper atmosphere blow at more than 200 mph. Wind on the surface creeps just a few miles an hour. But here's the kicker: Since the air it's pushing around is so dense, a soft breeze in the face on Venus would feel like getting hit by a truck, scientists say. While the atmosphere reflects most of the Sun's radiation, there are regions in the upper layer of clouds that absorb nearly half of the ultraviolet light aimed at the planet. These spots occur globally, showing up in one area and then another, sort of like an algae bloom in the ocean. They also appear to contain an abundance of a type of sulfur compound unlike any seen here on Earth. Scientists haven't been able to explain what in the region is absorbing all the ultraviolet light. Some scientists think that these mysterious regions could contain photosynthetic microbial organisms, like those that live in the water droplets of clouds in Earth's atmosphere. "They might do photosynthesis in the ultraviolet as opposed to the visual spectrum. It's a tremendous amount of energy if you can make use of it instead of being killed by it," said David Grinspoon, a planetary scientist for NASA and the Southwest Research Institute. "It's unusual, but natural selection makes the best out of adversity." The presence of sulfur is somewhat counter intuitive to life, however, since too much of it is usually harmful to organisms. But it reacts in interesting ways in ultraviolet light, Grinspoon said, and it could be used as a sunscreen for organisms and help harness energy for metabolism. Venus's clouds appear to have everything life needs to get started, including energy sources and a liquid medium, although it remains to be seen if the droplets are stable enough to last long enough for organisms to live and reproduce. It's not quite as hot in the upper layer of clouds as it is on the surface, and there is even a little oxygen around, produced when ultraviolet light reacts with carbon dioxide. Although, just because on our planet many forms of life crave oxygen and can't stand excessive sulfur, that doesn't mean that's how it works other places. "We're ignorant of life in the universe," Grinspoon told SPACE.com. "We only have one planet that serves as an example and in science it's not good to derive information from a sample size of one." Lightning cracks several hundred times a minute on Earth, but for as long as scientists have studied Venus they haven't been able to say definitively whether it too has lightning, and it's important for researchers to solve this mystery. "The technical side is that lightning destroys equipment on Earth all the time. If we're going to put equipment in Venus' atmosphere or in a cloud someplace, we have to be careful of lightning," said Chris Russell, a planetary physicist at UCLA. "From a planetological sense, lightning takes the atmosphere up to higher temperatures, and then chemistry can happen that doesn't happen at other times. Maybe lightning was important in the origin of life on Earth." There are two proven ways to detect lightning on Earth - listen to it interfere with electromagnetic radio frequencies or directly visualize it. Unfortunately, what works well here hasn't produced consistent results there. On previous missions, scientists thought they detected the tell tale sounds of lightning on the evening side of the planet. But when Cassini-Huygens did two low orbits of Venus on its way to Saturn, the results were different. "We saw nothing, just dead nothing," said Donald Gurnett, a physicist at the University of Iowa who helped monitor the readings from Cassini. "But when we flew by Earth, we started detecting lightning halfway out to the moon, and we're detecting it on Saturn." It could be that the atmosphere is so thick that it hides lighting from us. But another problem could be that we're looking for the signs of lightning that goes from a cloud and strikes the ground, which may not happen on Venus because the lower atmosphere is too thick for lightning to work through. "On Venus we could be seeing much longer bolts going horizontally or up into the ionosphere, so the basic radiation pattern might be different," said Russell. Venus Express is outfitted with a camera that can take images in infrared and visual spectrums as well as a device called the Flux Gate Magnetometer, which searches for lightning signals 128 times per second. Two years of scouring Venus with these devices should provide a better idea of lightning's existence on the planet. Venus was formed about the same time as Earth, around 4.6 billion years ago, but you wouldn't know from looking at it. "The surface of Venus looks geologically young, about 500 million years old," said Steven Hauck a planetary geologist at Case Western Reserve University. "And we know this from the apparent lack of impact craters." The planet is essentially devoid of impact craters, suggesting that at some point there was a significant geologic event that resurfaced the entire planet. This is another debated idea, though, since the surface shows no obvious plate tectonics or seismic activity, and we also can't tell whether it is still volcanically active. "We don't see the results of horizontal motions that are part of plate tectonics that we know on Earth," Hauck said. "And we can't distinguish if this was a long period that came to an end or a global, catastrophic resurfacing of the planet." The planet rotates counterclockwise, opposite Earth and most other planets, and does so exceedingly slow - one day on Venus equals 243 Earth days. Scientists have speculated that a massive collision with an asteroid long ago may have reversed and slowed down Venus's spin. This event may have also set off a global volcanic reaction that led to the planet's resurfacing. It will take Venus Express less than half a year to travel to Venus, and considering our lack of knowledge of our sister planet and the possibility that her clouds might harbor life, it seems somewhat surprising that Venus Express is only the fourth mission dedicated to studying Venus. "We need more Venus missions to really answer the biggest mysteries about the planet," Grinspoon said. "Venus Express will be a great mission and will tell us a lot about the planet, but I think to really make the next leaps in understanding Venus we're going to have to do something more than just orbit the planet. We need to take the plunge and explore the clouds and the surface directly." This article is part of SPACE.com's weekly Mystery Monday series.